The Worcester School Committee (unlike the City Council) does not have a public comment period on the agenda. They will as a custom suspend the rules to allow a member of the public to speak to an item on the agenda, however; it's a good idea to tip off the clerk (that's Dr. Friel; she sits to the Mayor's right as you look at the dias) ahead of time that you'd like to do that. If you're going tonight, you could address school building conditions under the Finance and Operations Subcommittee report coming back, which had many facilities items on it, or under item gb #8-123.4, which has a section dealing with repairs. Do keep in mind that under Mass General Law, public comment at School Committee meetings is ALWAYS at the discretion of the Chair. If he's in a good mood, the Mayor will give you three minutes and not stick to it. Worcester does have school buildings with AC (largely those constructed after in the past several decades); it largely does not have buildings that have been retrofitted with AC (Forest Grove being the big exception that comes to mind; it got it as part of the city-funded rehab in the 1990's). It isn't as easy as getting a whole bunch of single units and plugging them all in (even setting aside the cost of those units); air conditioning units are a huge draw and Worcester has a lot of classrooms. The additional electrical load would be staggering (plus the fire department gets techy about lots being plugged in). Yes, the administration building does have AC, but (as I keep pointing out on Twitter) most of who works in the admin building are clerks and secretaries and they work year round. (Plus, DAB is of the same era as the buildings that are the worst right now; it was built in 1890) You can of course ignore this, but I suggest that line of argumentation won't work. ..and while that's a foundation budget thing, it also isn't happening places where districts are funded over foundation. You might also note that the city has been funding captial expenses at a flat $3M a year for...some time now, and while the new high schools (and replacement windows and such) are great, it isn't taking care of basic capital needs of the buildings. As I mentioned yesterday, the district is already having to postpone needed scheduled boiler replacements to replace ones that have simply failed. 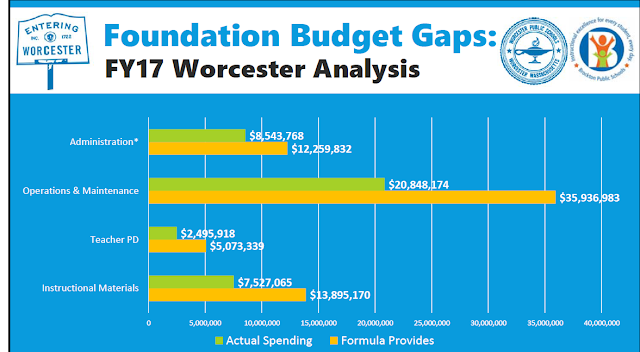 Capital funding is something School Committee could better advocate for, and it's also an issue to take up with your city councilor. If you can't make it tonight, contact information for the School Committee is here, for the City Council is here, and the superintendent's office is here.